Damping off is a seedling disease that may develop before or after the emergence of turfgrass seedlings. Sparse emergence of seedlings and slow establishment occurs when seeds are infected prior to emergence. When the disease develops after emergence, seedlings initially appear flaccid and twisted as if suffering from wilt. The seedlings continue to decline, turning dark in color and greasy in appearance, and then quickly disintegrate to leave areas of bare soil. Damping off initially develops in localized spots, but the disease often spreads rapidly to injure large areas. 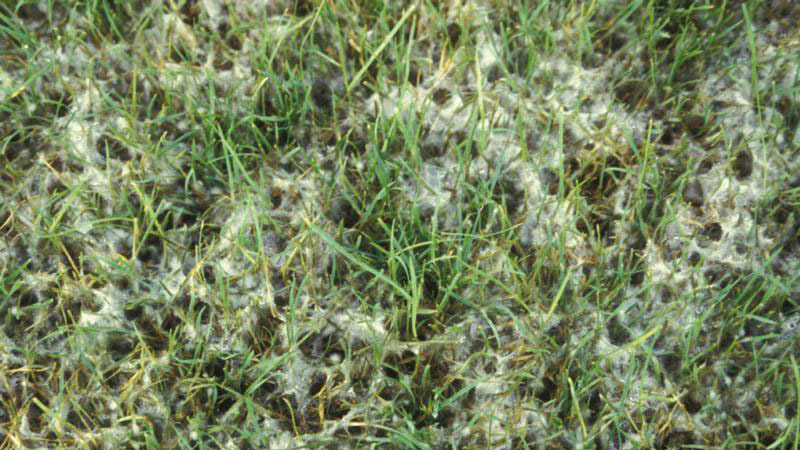 In severe cases, tufts of mycelium may be observed in affected areas when the leaves are wet. Turfgrasses are most susceptible to damping off during germination and seedling emergence. After emergence, the turf gradually becomes resistant to the disease as it matures. Damping off is most severe when temperatures or light levels are unfavorable for seedling growth. Pythium causes the majority of damping off problems during warm or hot weather, whereas Rhizoctonia is more prevalent during cool weather. The disease is encouraged by excessive nitrogen fertility and extended periods of leaf wetness. High seeding rates encourage damping off by producing dense populations of seedlings that mature more slowly and remain wet for extended periods of time. Use recommended seeding rates, which are designed to speed the maturation of seedlings and minimize the window of time when they are susceptible to damping off. Apply a high phosphorous (P) starter fertilizer at the time of seeding to provide 1 pound of P per 1,000 square feet. To encourage rapid germination, water lightly and frequently to keep the seedbed moist but not saturated. As the seedlings emerge and develop a root system, gradually reduce the irrigation frequency, and ensure that the seedling leaves dry completely in between irrigation cycles. Apply a thin layer of straw or other mulching material to hold in moisture, but do not over-apply as this will retain too much moisture and increase the risk of damping off. A second fertilizer application is typically made around the time of the first mowing, but do not apply more than 0.5 pound of readily available nitrogen per 1,000 square feet. 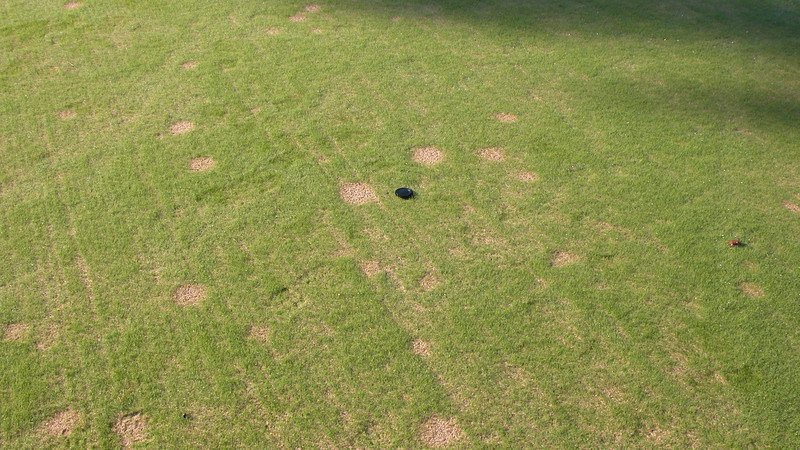 Do not attempt to establish turfgrasses in low-lying, wet areas where damping off is most severe. Fungicides are available for control of damping off, and may be applied as seed-treatments or directly to the seedbed. If damping off is observed, submit a sample to a diagnostic lab for accurate diagnosis because different fungicides are needed for control of Pythium and Rhizoctonia species. Note that fungicides labeled for damping off only have activity against Pythium species. The fungicides labeled for brown patch are needed to provide effective control of Rhizoctonia damping off. Please reference the disease profiles for Pythium blight and/or brown patch for fungicide recommendations if you know which pathogen is prevalent in your turf. Figure 1. Damping off stand symptoms. Figure 2. Damping off fungal symptoms.